AIM Member ﻿Sharon Chrystal de Vries has knitted this beautifuly delicate 'Shadows Shawl' using Maderia Catona 80 thread and she is offering the pattern for sale as a "special" on her blog for one week only, between the 17th October and the 23rd October. 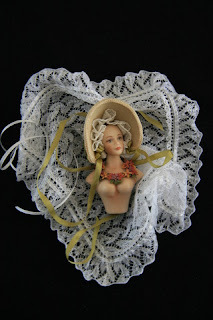 Then in November, Sharon will be sharing a tutorial for the lovely dolls bonnet, flowers and necklace on her blog. What a beautiful piece of work Sharon! !